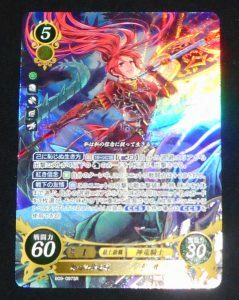 Cipher Series 9 Set Release! 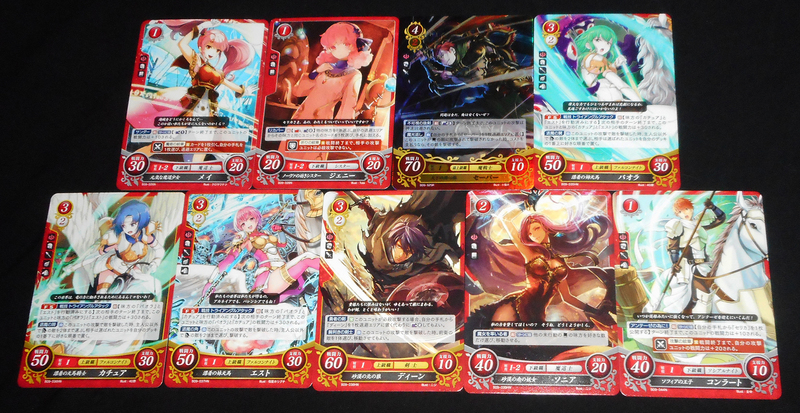 On Thursday, 22 June, Fire Emblem Cipher released its 9th booster series! The set, translated as Roaring Echoes, is our first tri-colour set since S3. An associated Structured Deck called Lands of the Gods was also released on the same date. The first half of the set, and the entirely of the ST Deck, is dedicated to characters from the newest Fire Emblem entry: Fire Emblem Echoes: Shadows of Valentia. 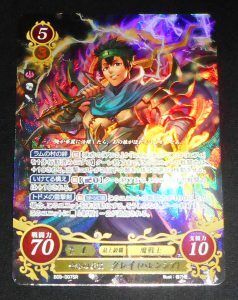 The remaining cards are split between characters from Binding Blade and it’s spin-off manga Hasha no Tsurugi, and characters from Path of Radiance and Radiant Dawn. WARNING: Some of the cards pictured in this set contain character and story spoilers for Echoes. If you have not yet finished the game and wish to remain unspoiled, proceed with caution! The first fifty cards of the set contains cards for characters from Echoes. Since Echoes takes place in the same universe and time frame as Marth’s games, the cards are red as well and use the same Sword of Light faction symbol. As dual Main Lords, Alm and Celica share the spotlight for this half of the set, with three cards each–including a beautiful joined-art card for their SRs. 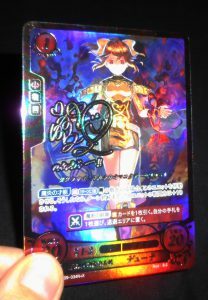 Both cards also have rare SR+ variant cards that include a gold foil signature from their Japanese voice actor. Alm’s card is signed by Natsuki Hanae and Celica’s by Nao Toyama. As has been standard since S6, signed cards do not receive alternate artwork in this set. 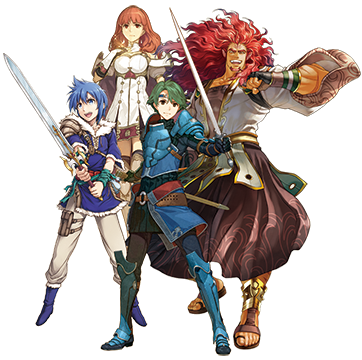 On Alm’s side, many characters in the Deliverance are represented. 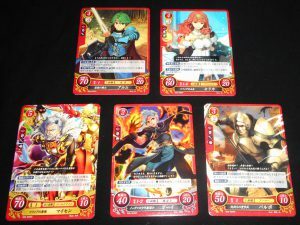 All four of Alm’s friends from Ram Village get cards in the set using their “standard” promotions: Gray as a Mercenary, Tobin as an Archer, Kliff as a Mage, and Faye as a Pegasus Knight. Gray even gets an SR card in his Dread Fighter promotion! Other Deliverance characters represented include Lukas, Silque, Clair, Clive, Mathilda, Delthea, Tatiana, and Zeke. Clair earned herself the final SR slot on Alm’s side with some beautiful artwork as a Falcon Knight. 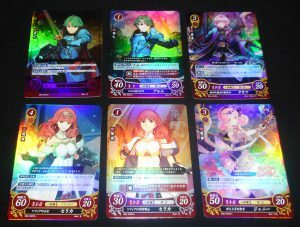 Many characters in Celica’s party also get set cards, including Mae, Genny, Saber, Palla, Catria, Est, Deen, Sonya, and Conrad. The Whitewings are particularly cute for being displayed each fighting different types of Terrors! 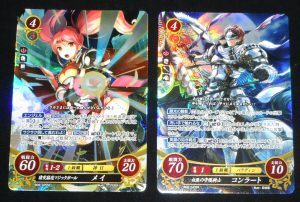 Mae and Conrad snag the final two Red SR card slots, each with a dynamic battle pose. 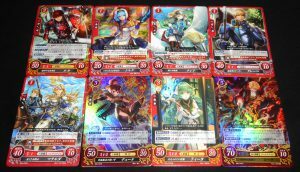 A few villains also get cards in the set, including Fernand, Berkut, and even a Necrodragon! Berkut’s cards are particularly tragic, showing him and Rinea dancing happily in his unpromoted card, followed by a more depressing view in his R card after both have received Duma’s “blessings”. The secret card for this set is also a Red card, though it breaks away from recent secret card traditions. Delthea B09-034N+X is actually based on her S9 N card of the same number, but with a twist. The art for the N+X is based on her initial appearance as a villain when she was possessed by Tatarrah, and the first skill is also different between the two cards. 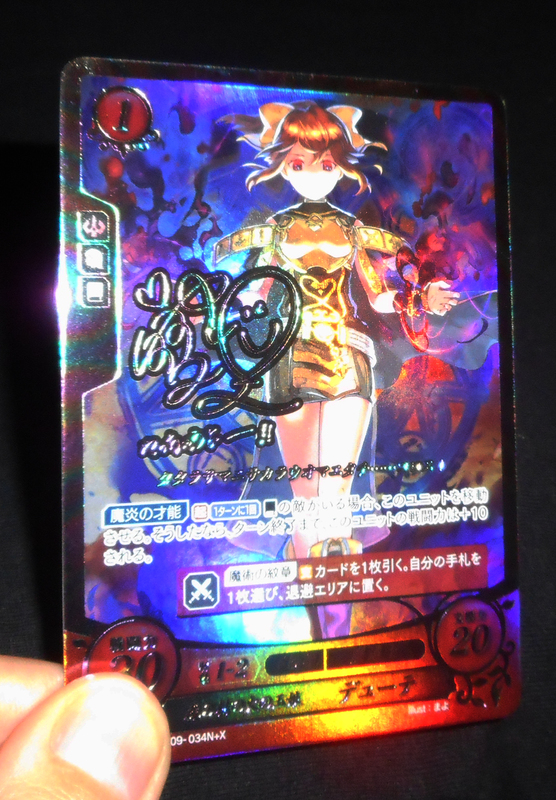 The secret card is signed by Eri Suzuki, her Japanese VA and a frequent guest on the Cipher livestream. 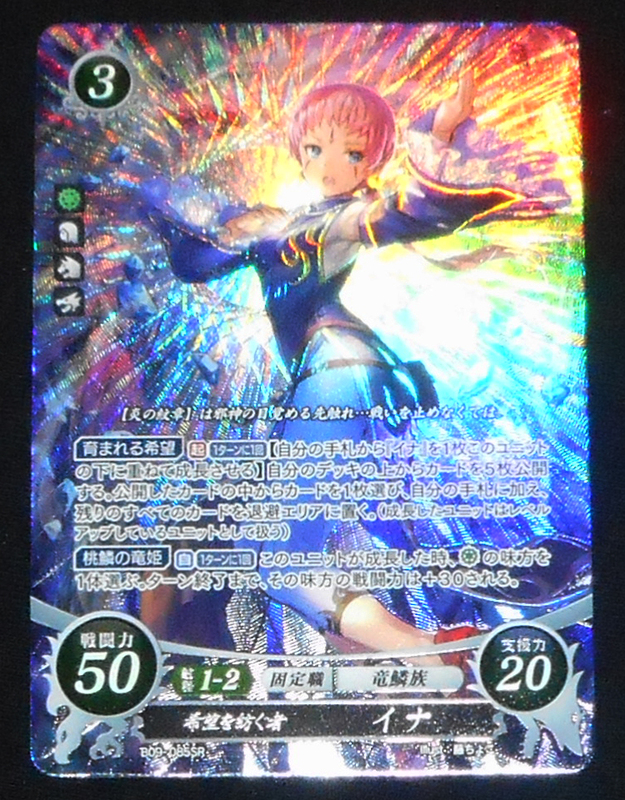 In addition, the card features a swirly, rainbow foil previously unseen in Cipher. The next quarter of the set is dedicated to purple cards for Elibean characters. The lead Lord this time around is Al, the main character of the Hasha no Tsurugi manga. As such, he nabs the opening card slots including an SR card. 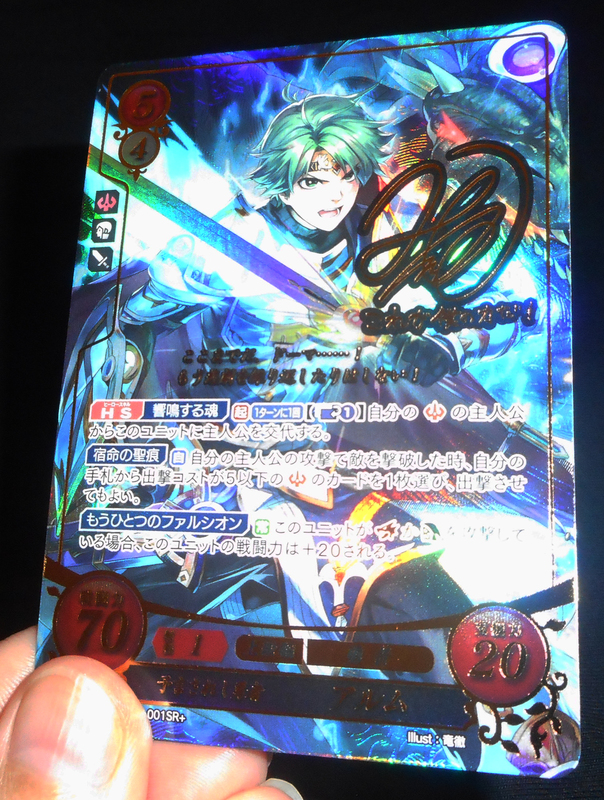 His SR+ is particularly notable for having two signatures! 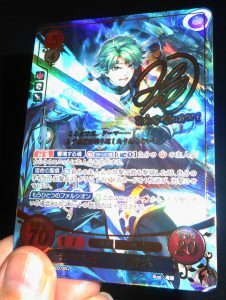 Both the manga’s author, Hiroshi Izawa, and its artist, Kotaro Yamada, provide signatures on the card. 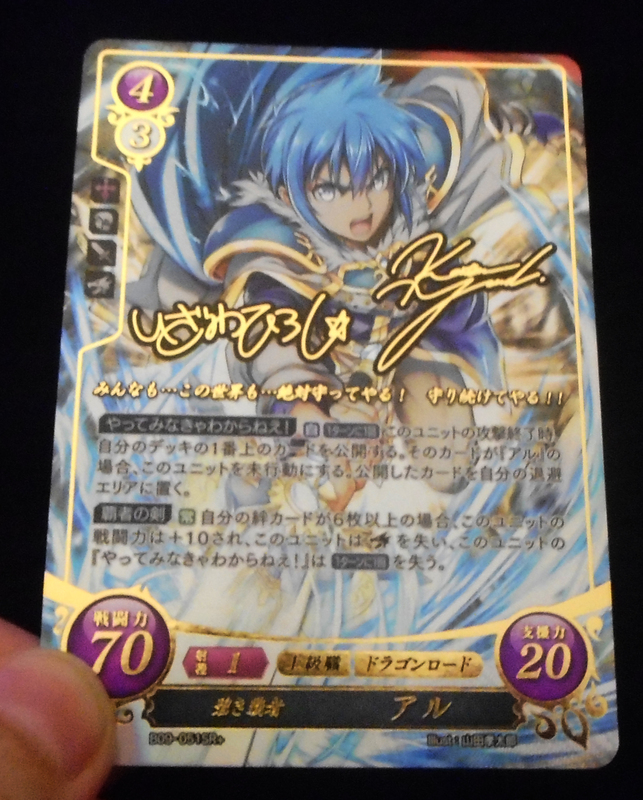 Yamada was also the artist for this card and many other Cipher cards in the past. He is even a frequent guest on the Cipher livestreams. 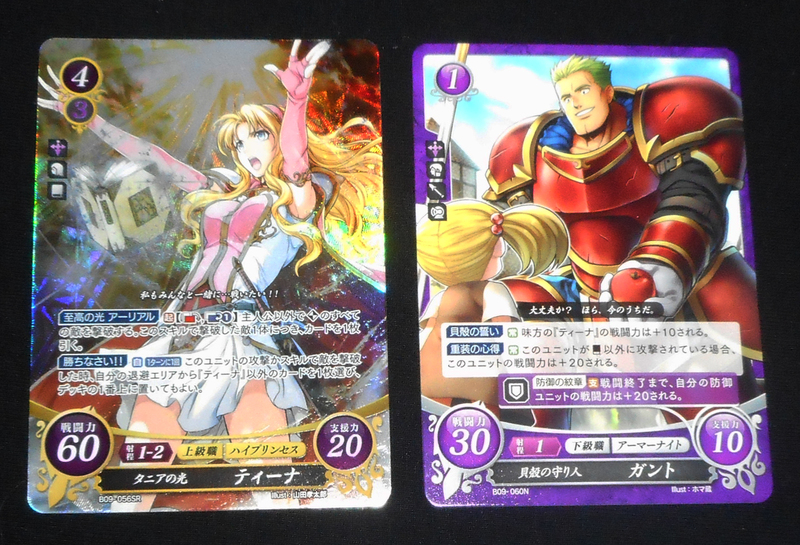 Two other manga characters who received cards may be familiar to fans who have played Binding Blade but not yet read the manga. Both Tiena and Gant get named special weapons in the game, along with Al. Tiena herself received the second purple SR of the set, also illustrated by Yamada. 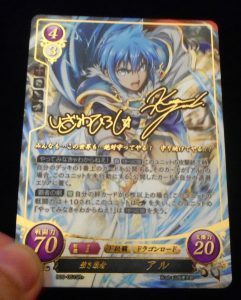 Three other manga-exclusive characters get cards as well: the Mage Jemmie, her brother Zeed, and the Swordsman Kilmar. The remaining purple cards are given to characters who appear in Binding Blade itself and have notable appearances in the manga. 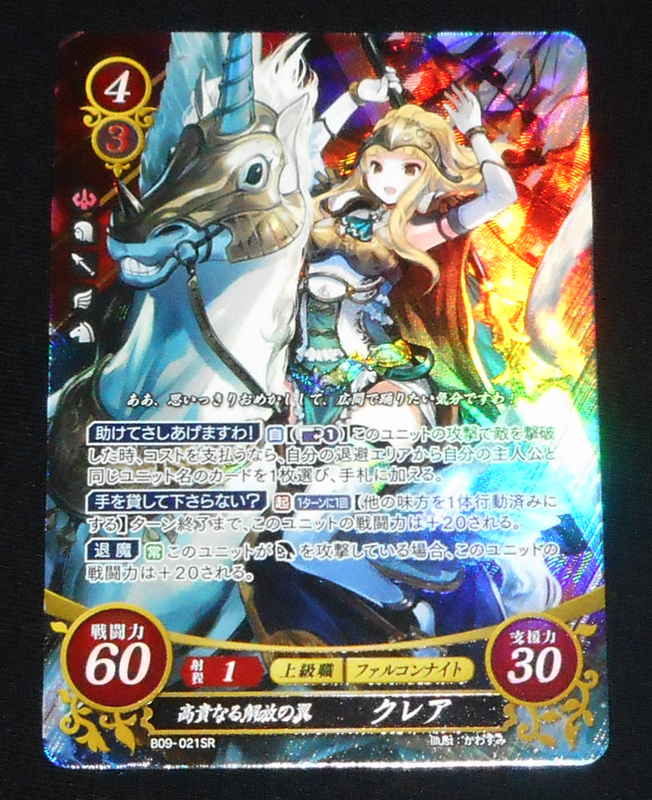 Many of them are characters who were skipped over in the previous Binding Blade set, such as Echidna, Elffin, Raigh, Guinivere, Igrene, Douglas, and finally Zephiel, who also snags the last SR of the set. 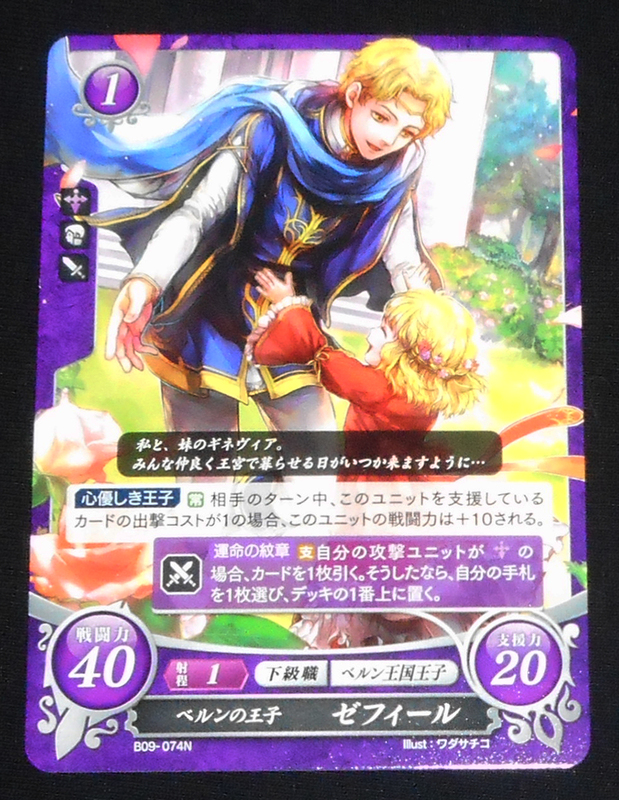 Zephiel’s unpromoted N card is a particular adorable card that shows his younger self as he appearing in Blazing Sword with his younger sister. 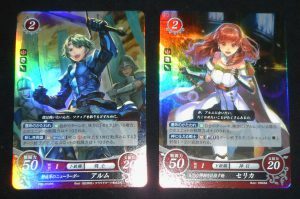 Roy and Lilina receive cards too, the former even getting a joined-art card with Al that has a bunch of other characters in the background. 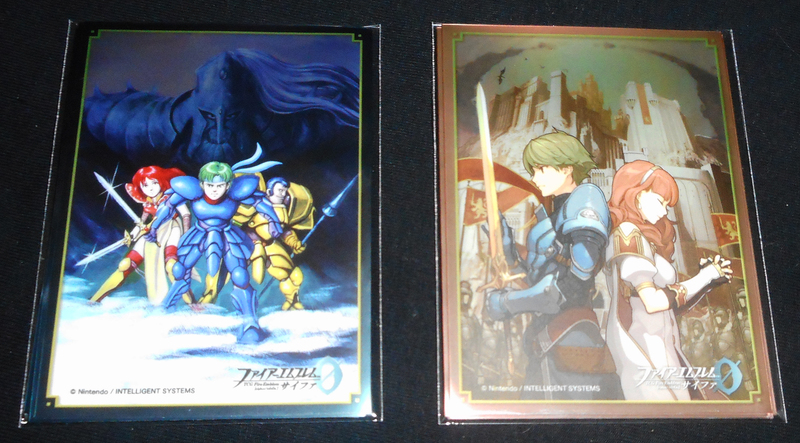 The final section of the set is devoted to green characters from Tellius. As earlier stated by Ryota Kawade, Cipher’s head producer, the purpose of this portion of set was to give more attention to Laguz characters. 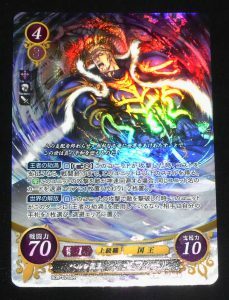 As such, Skrimir of Radiant Dawn is the headliner character, getting the opening cards and also a particularly ferocious SR. Both cards, along with many other Green cards in this set, were drawn by Senri Kita, the official artist for the Tellius games. 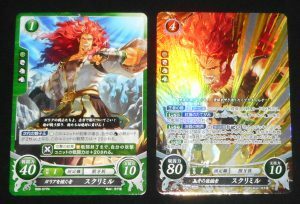 Other members of the Beast Tribe gaining cards in this set include Lethe, Mordecai, Ranulf, and Caineghis, the King of Gallia. 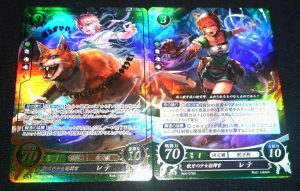 Lethe has a rather special R+ card that forms a joined art piece with her regular R card showing her during a battle transformation. 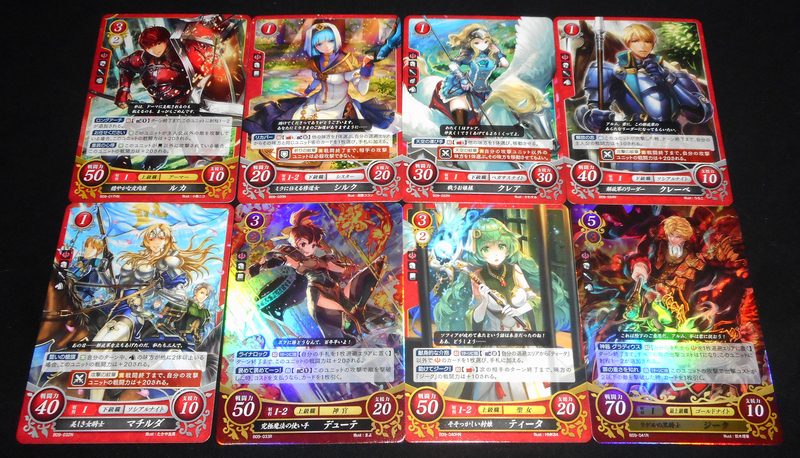 The Bird Tribe gets some representation as well, with cards for Ulki, Janaff, Tibarn, Naesala, and Rafiel. 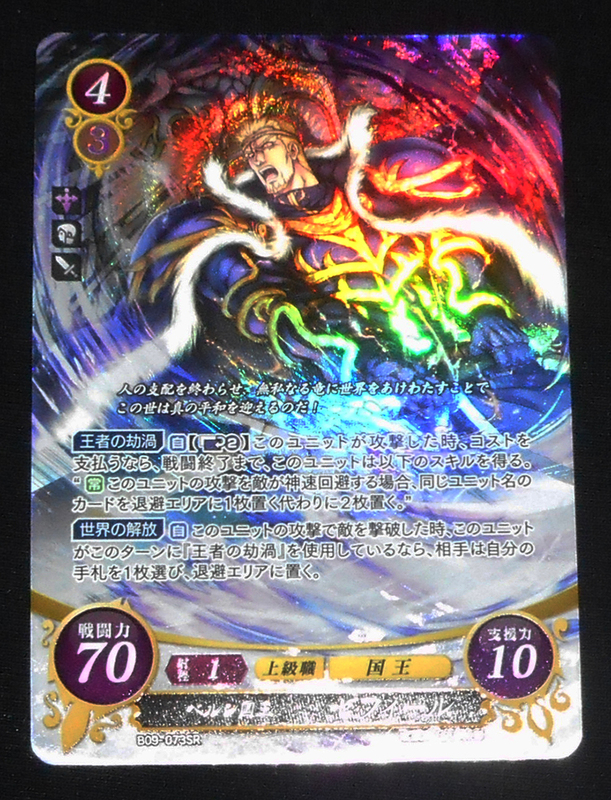 Finally, we also get a few Dragons in the set as well, including Nasir, Ena, and Dheginsea, the King of Goldoa. Ena gets a rather beautiful card as the second SR of this portion of the set. Green cards are not only given to Laguz, however. A few Beorc have sneaked into this set. 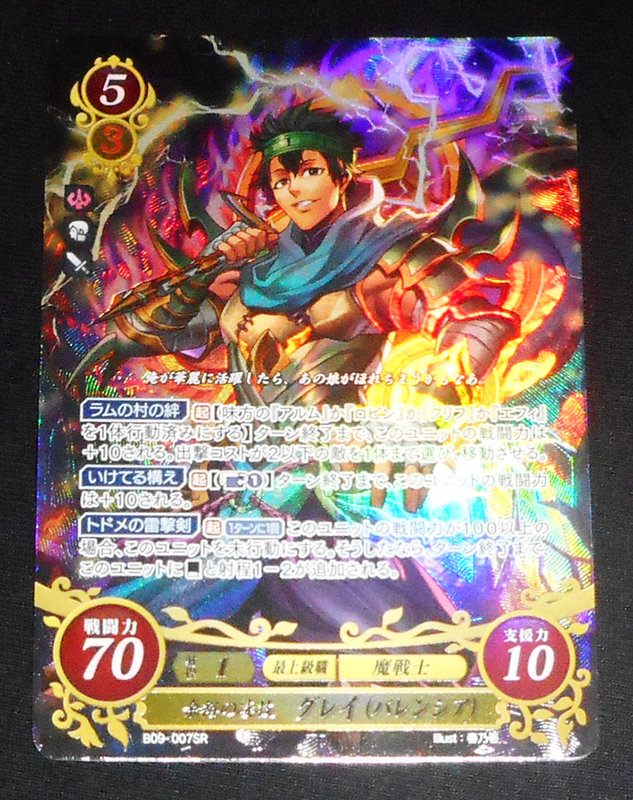 Ike, Mist, and Ilyana were likely included based on their popularity, but Zihark and Jill both have connections to the Laguz that are reflected in their cards’ effects. Jill gets an action-packed card as a Dragonlord as the last SR of the set. All four Cipher mascots were chosen to receive cards in S9! 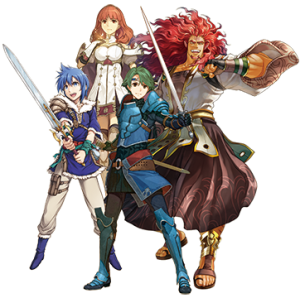 Echoes players may be familiar with Emma, Shade, Yuzu, and Randall now that they’ve appeared as characters in Echoes DLC. They are split between the colours: Emma and Shade reprise their Echoes characters in Red, while Yuzu is a Purple General and Randall a Green Bow Paladin. 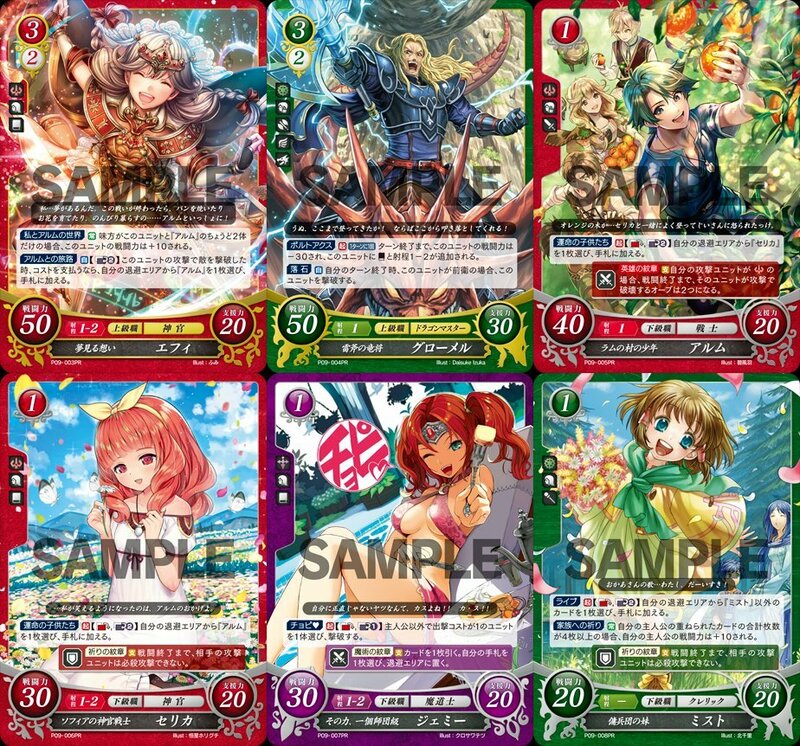 The ST Deck for this set is also based around Echoes characters. 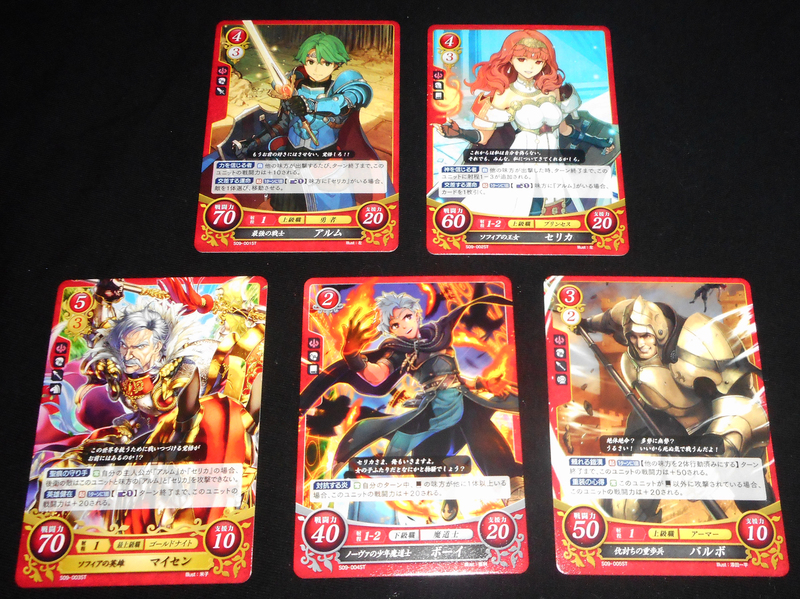 While most of the cards are reprints of cards from the set, the deck comes with five exclusive cards for Alm, Celica, Mycen, Boey, and Valbar. 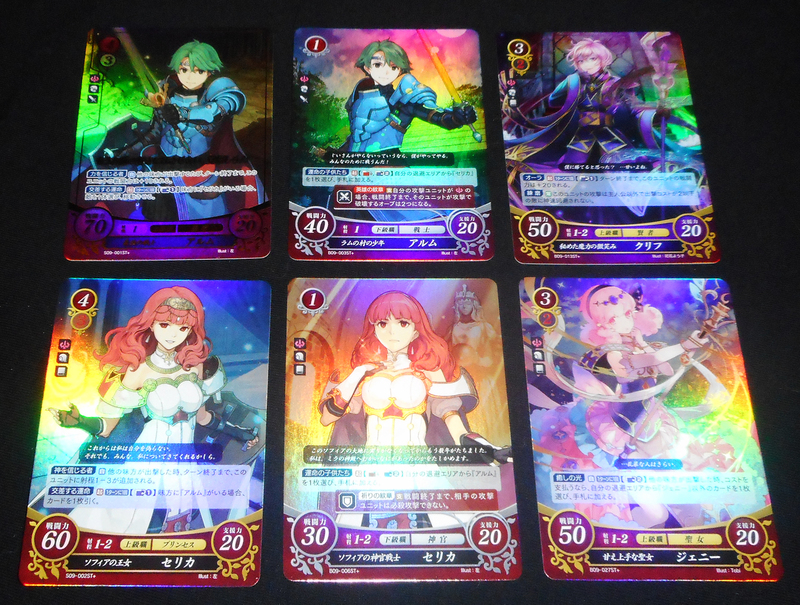 Additionally, the deck comes with holo prints of Alm and Celica’s exclusive cards, as well as four extra holo prints of cards that are non-holo HN cards in the set itself: Alm and Celica’s cost 1 cards, and also the promoted cards for Kliff and Genny. Included within the packaging aside from the cards themselves are a playmat, instruction booklet, and also a DLC code to download some cosmetic items for Echoes on the 3DS. Sadly, the code only works for Japanese copies of the game. You can learn more information about the DLC items here. As usual, there are a number of promotional goodies released alongside Series 9, many of them coming within the booster boxes themselves! Each booster box of S9 contains a promo sleeve pack and a promo card pack that includes a preview promo for S10, and an anniversary reprint. 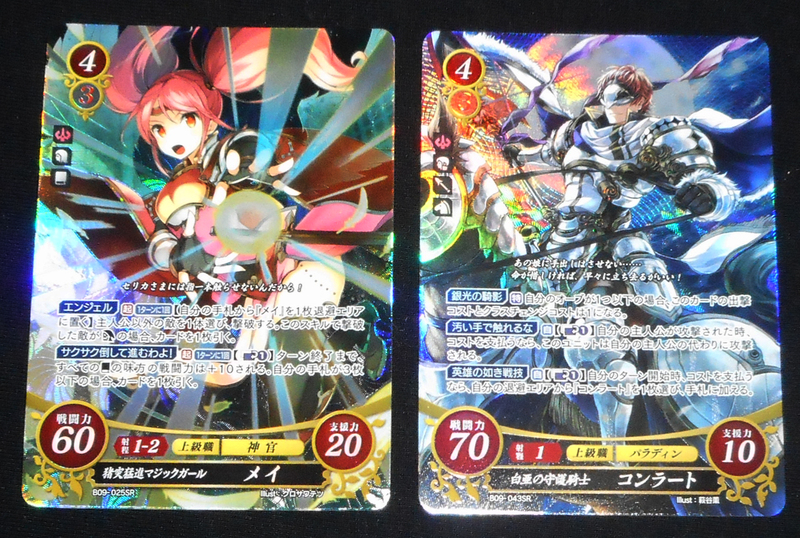 The promo sleeves for this set are both based on Valentian games. One shows the box art for the original Gaiden on the NES while the other shows the updated artwork for Echoes‘ 3DS box. Each pack contains five sleeves. 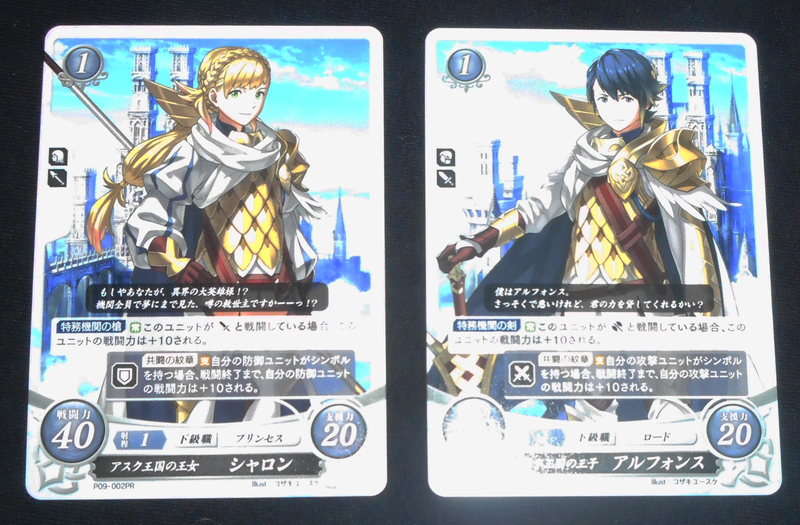 The two preview promos for S10 go to the two lords of Fire Emblem Heroes: Alfonse and Sharena. S10 will be released in September, and features characters from Thracia 776 and Fire Emblem Fates in addition to Heroes. As S9 releases around the 2nd anniversary of Cipher, the last booster box goodies are anniversary reprint promo cards. Both Elincia and Lilina were originally magazine promos released during S3 and S5 respectively. Their reprints contain a 2nd Anniversary stamp in the upper right corner. 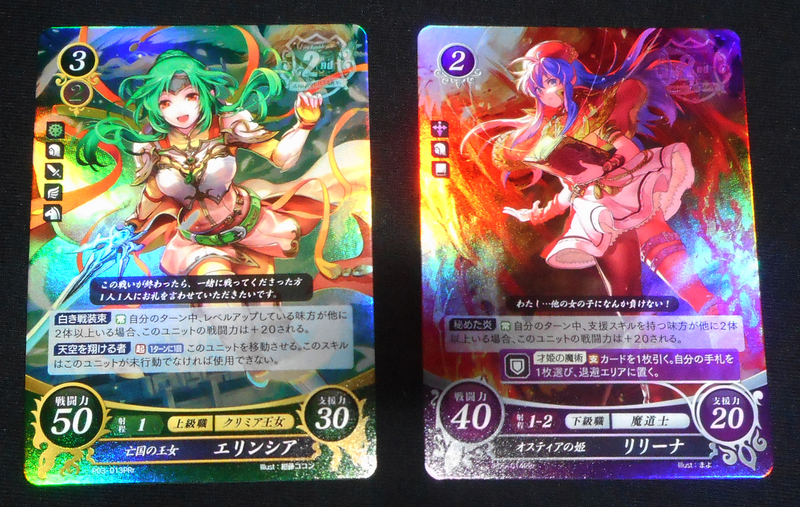 Elincia is packaged with Sharena, and Lilina with Alfonse. In addition to the box promos, another promo event is being held in Japan with the release of S9! 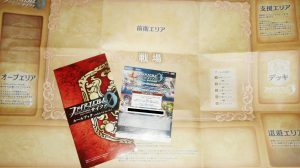 Participating retailers in Japan are giving out special Cipher-themed clear files to people who purchase eight or more packs of Cipher cards. AmiAmi is one of the included retailers, so these files can also be easily earned by international Cipher collectors. The clear files are based on Japanese paper sizes, which corresponds to International A4 paper size. American Letter size paper is a bit shorter and wider than A4 size, but still fits inside the files, just not quite as comfortably. A number of promo cards have also been revealed for S9. The first two promo cards of the set, as always, are the preview promo cards shown above. 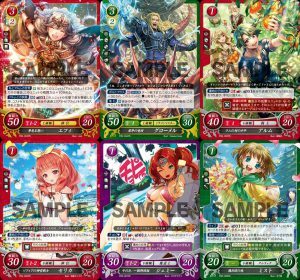 The next six promos are special Tournament promo cards available at Cipher tournaments in Japan. Mage Faye and Grommel are both completely new cards while Alm, Celica, Jemmie, and Mist are reprints of cards from S9 with alternate artwork. Each player who participates in an official Cipher tournament receives one pack that contains two of these cards chosen randomly, and winners receive an extra pack. Since these cards are only available to tournament participants, they cannot be bought from regular online retailers. However, they’re often resold on Japanese auction sites. Two more S9 promo cards were recently released in Japan. 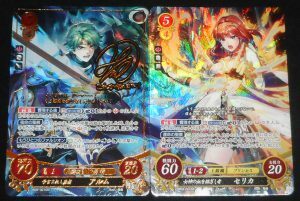 Alm (P09-010PR) and Celica (P09-011PR) were released in the August issues of Nintendo Dream and Dengeki Nintendo respectively. These issues were released on 21 June, the day before S9’s release. The final known S9 promo card features Anna as she appears in Heroes. This card will be available to anyone who attends the Go! Go! Summer Tour event in Japan. The event begins this Saturday, 1 July, and lasts throughout July at various venues in Japan. You can read further details about the event and its merchandise in our earlier article here. 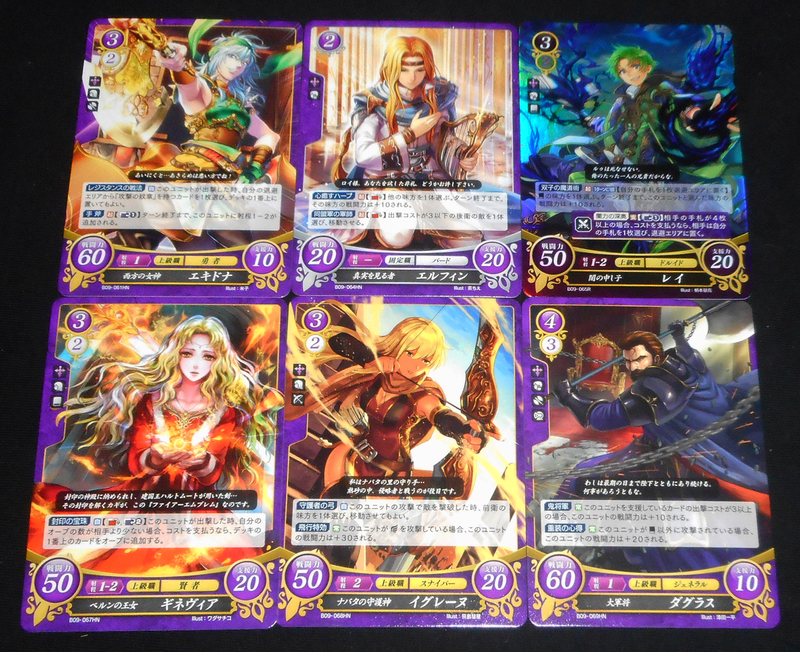 For now, that’s all we have regarding Cipher Series 9 and its associated promos. Unless another Guidebook becomes available, it’s unlikely there will be any more revealed for this set. However, we will indeed share any further news as it becomes available. 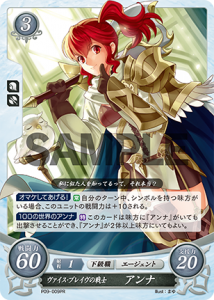 In the meantime, if you’re interested in discussing Cipher with other fans, come visit the Fire Emblem TCG section of the forums! You’re welcome to ask questions, get help with card rulings, post your pulls, trade/buy/sell cards, or arrange for online matches. That Lethe card looks great! I want it!